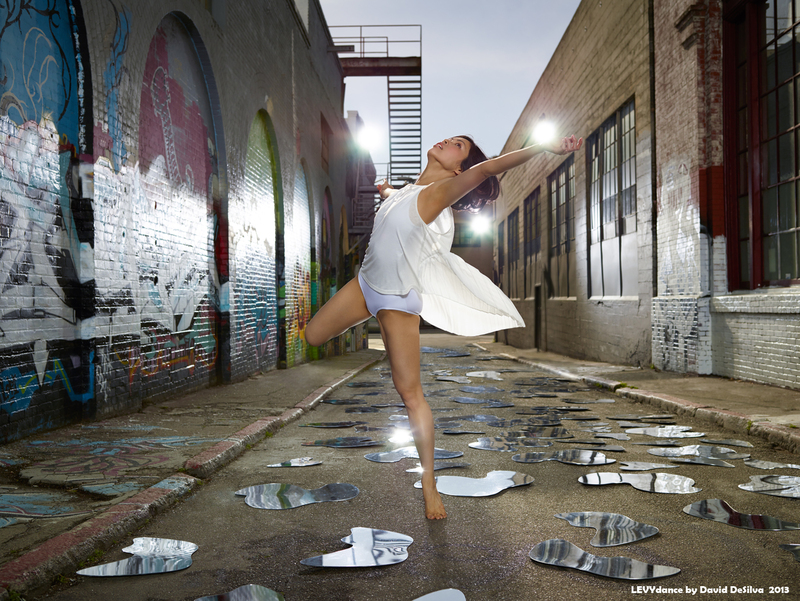 Last week, LEVYdance celebrated their tenth anniversary in true San Francisco style, with an outdoor performance just steps away from their studio on Heron Street in SOMA. Artistic Director Benjamin Levy and the entire LEVYdance family invited their audience and their neighborhood to join them for a collection of choreography from the past decade: “pOrtal” (2002), “if this small space” (2005), “Holding Pattern” (2004), and “That Four Letter Word…” (2004). Multiple vantage points – rooftops of adjoining buildings, the center area created by the stage perimeter – reflected this group’s multi-faceted artistry and vitality. LEVYdance is a contemporary company that takes creative risks, values strong modern dance technique, and successfully marries form and content in composition. Possessing all of these qualities and characteristics is less common than you would think; in fact, it is quite rare. LEVYdance is special, and another ten years of their work would be a gift to the larger modern dance community. As the title suggests, “pOrtal” was all about being on the edge of something and the importance of falling forward to it. Levy’s choreographic abandon coupled with the dancer’s total commitment birthed an unprecedented level of excitement. There was no hesitation, no fear, no trepidation. In addition, a deep sense of the collective was present; a group effort; a responsibility to and awareness for each other. Scott Marlowe and Paul Vickers’ duet was one of the most elegant movement phrases I have seen in a long time. In particular, the lifts and balances in their pas de deux defied all choreographic and technical expectations. “pOrtal’s” final unison sequence brought together the two primary narratives: living into the unknown while still working toward a greater goal. “if this small space”, choreography by Levy and Rachael Lincoln, aptly characterized the notion of containment. Created in sonatina form, the solo piece had a three-part feel to it, with an exposition, development and recapitulation. Tasked with a purposeful space constraint, Marlowe (who also serves as the company’s Artistic Associate) began with a shivering motif; his whole body shaking and shuddering. The movement was tense and frenetic, yet somehow didn’t seem stressful – certainly a tough state to attain, yet also very representative of the small reflexive motions that happen constantly in our bodies. Next, Marlowe moved onto some more serpentine, flowy sequences, though still keeping within his prescribed space on the stage. Then, in the final moments of the work, he came to a place of calm stillness: a beautiful cadence for a stunning piece. Of the four dances on the program, “Holding Pattern” was my least favorite. Though it had some interesting lifts and sequences (both of which looked like they may have originated from contact improvisation exercises), it seemed very similar to “pOrtal”. And while it was both visually compelling and well-danced, I kept waiting for it to differentiate itself a little bit more. The entire company returned to the stage to close the tenth anniversary program with 2004’s “That Four Letter Word…”. At first I thought that this was the typical ‘relationship’ dance, of which most companies have two or three in their active repertory. But as I continued to watch the four performers (Marlowe, Vickers, Yu Kondo Reigen and Sarah Dionne Woods) cycle through Levy’s choreography, I realized that this wasn’t just about relationships, it was a brilliant essay on affection. Neither sentimental, farcical, angsty nor derivative, “That Four Letter Word…” was real, honest truth. Even as some humorous dance theater influences popped in (balloon props and a dramatic tango), the authenticity of the message was still the driving force. Concluding with the most fantastic quartet, the piece spoke to the essence of LEVYdance. Here is an intensely talented group of artists with deep respect for their work and for each other.